Meet Morgane. She’ll be our local guide for four days. 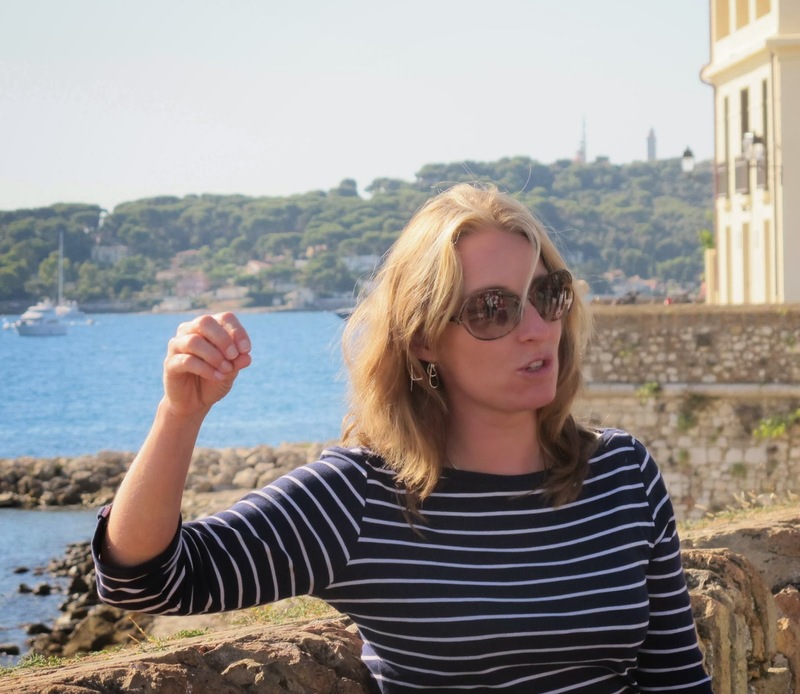 She lives in Menton with husband and children. She is French and has a delightful accent and copious knowledge of the French Riviera, as she calls it in deference to foreigners’ customs. She has guided day tours and part day tours for several years when Jeanne has brought her quilters tours to Nice, although it has been five – I think – years since we were last here. 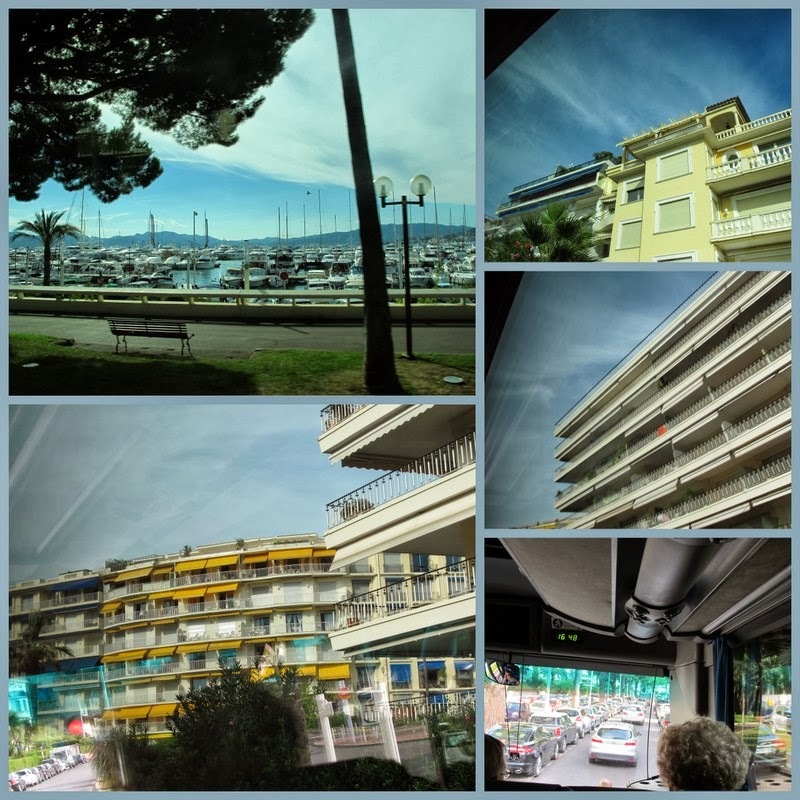 The general theme for today’s visits is “In the Steps of Picasso,” so we go to Antibes by coach (what Jeanne calls a bus) to see the Picasso museum there, in a place where he lived and worked for several years. We’ve hopped off the bus and counted off before we set out. There are always stairs. Why would we expect an exception now? When we get to the top and look out over the wall that once circled Antibes, there’s entire harbor full of really fine water craft. There are some really high end yachts at some of those docks. And out toward the sea and the quiet beach below. 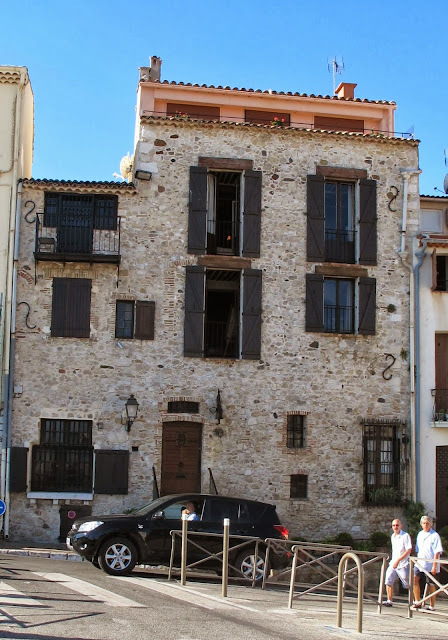 Most of the old stone buildings have been plastered over, but this one that had had the plaster taken off the original stone façade caught my eye, a legacy of my adventure building castles (well, sorta). 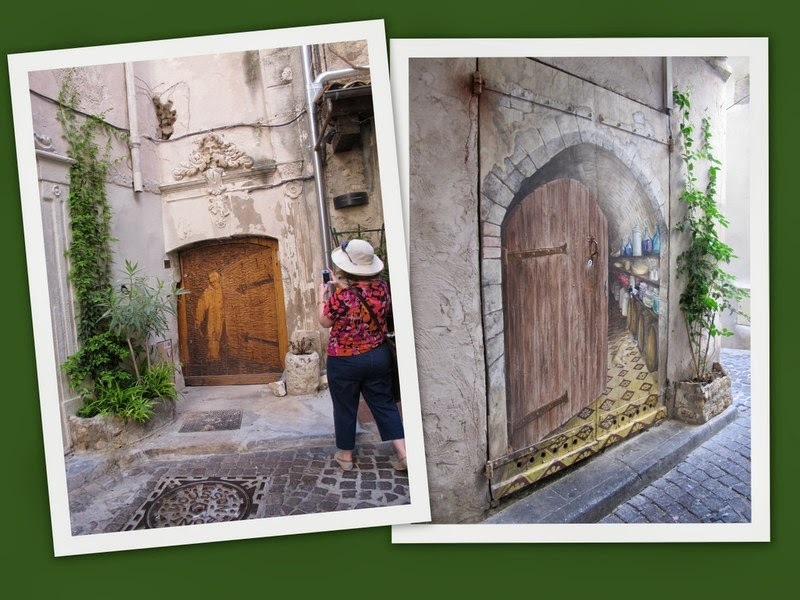 Walking through the old town in the direction of the museum, we see creative door treatments, one carved with a person opening a door, another with a wooden door ajar painted on --perhaps -- a garage entry. 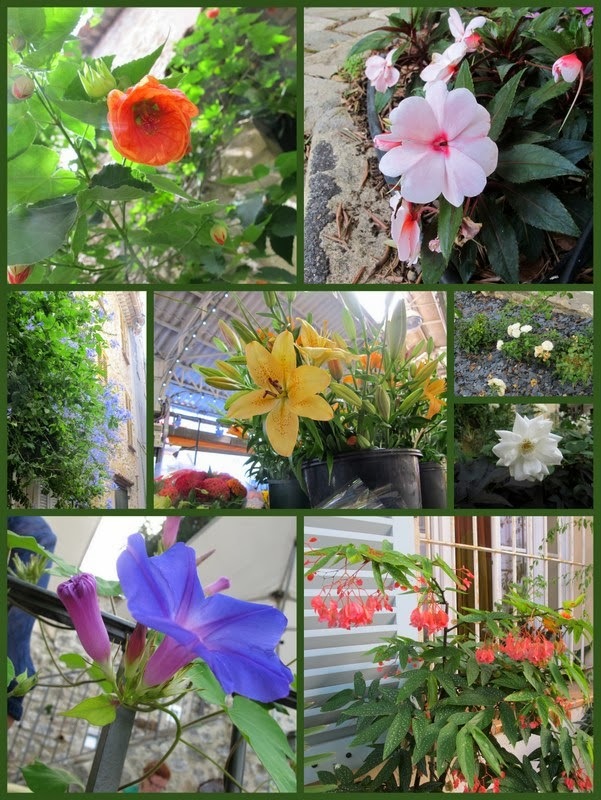 Flowers decorate every nook and cranny and are sold in the market in the lower part of the town. No photography is permitted inside the museum. 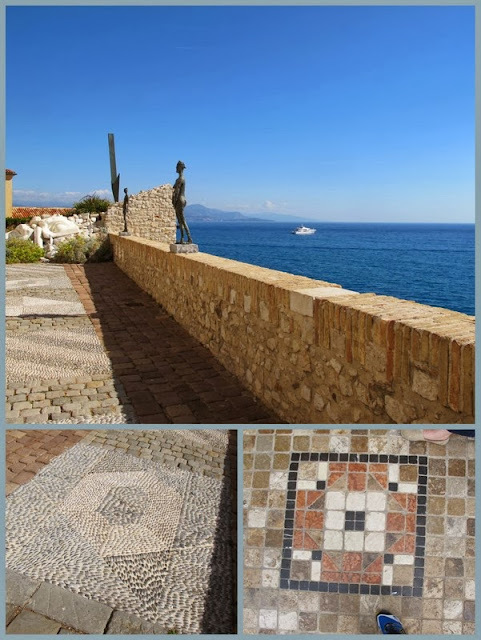 Maybe it’s stretching it a little to take pictures out on the terrace, like this one with a statue on the sea wall and designs in the pebble and tile floorings. 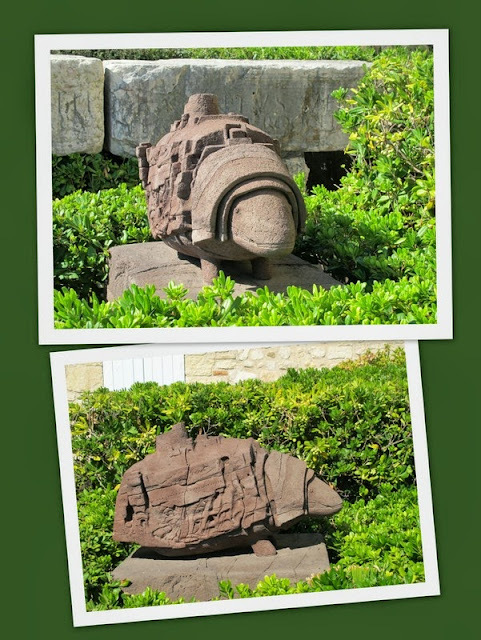 Or a fanciful carved armadillo in the garden. 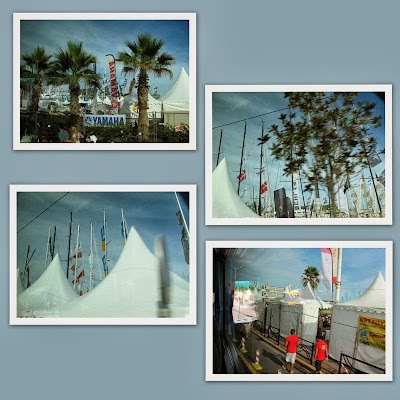 We are permitted to take pictures out the windows of the museum, over rooftops to the harbor and the sea. 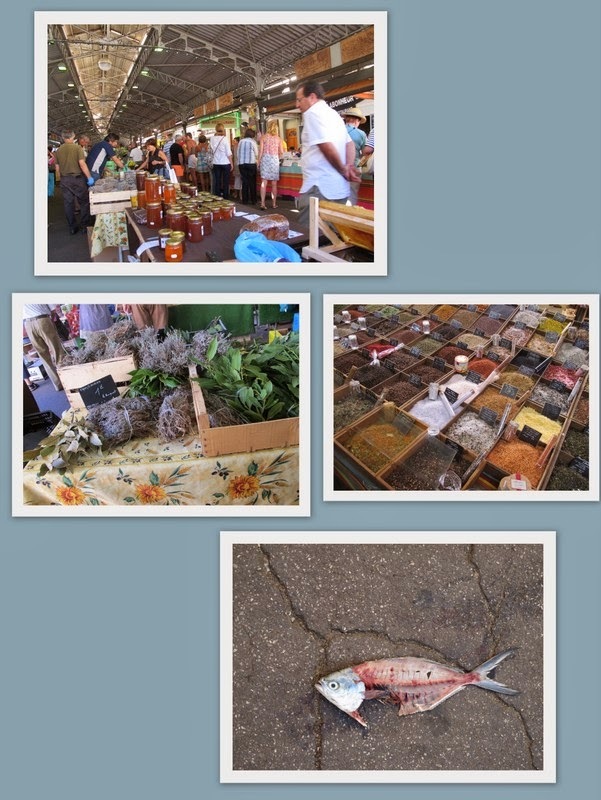 After the museum visit, we had a short time to browse the covered market, with its honeys and lavender, spices and a really pissed off looking fish. We return to our bus, past a major construction project originally intended for underground parking. 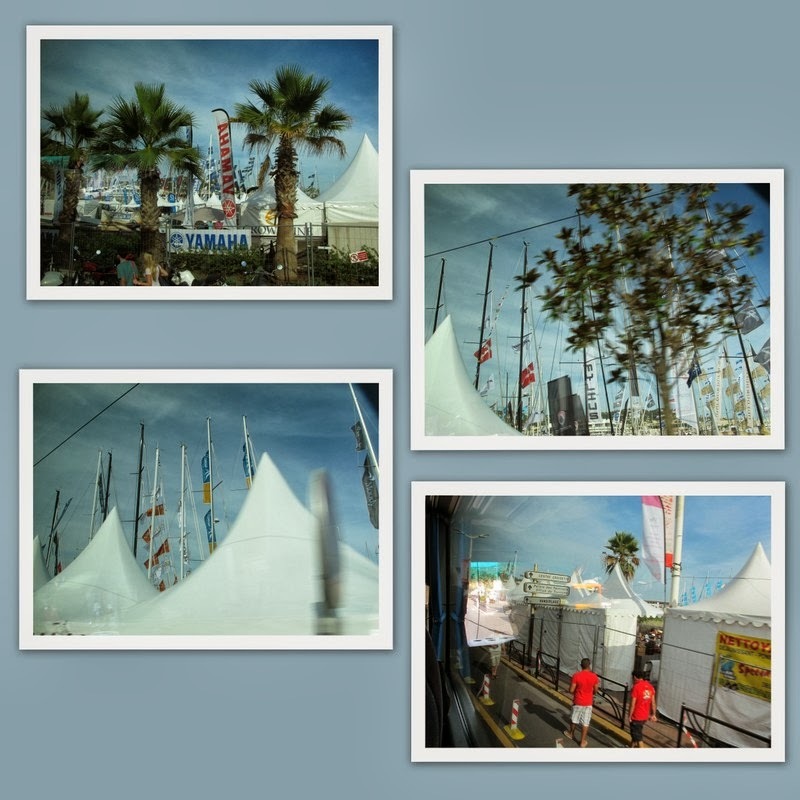 Bus parking, which used to be near the entrance to the old city of Antibes, is a long ways off for the moment, and the new parking construction is semi-suspended after running into archaeological artifacts below the current street level. We head for the mountain-top village of Mougins. The bus driver stops at a high point of the main road up, to let us off in a short level spot to walk to the hotel where we will be having a group lunch. We can see all the way to the Alps in the distance. We walk up a perimeter road to the hotel, l'Amandier de Mougins, where we are shown to a terrace with a view over the countryside, and tables set with glassware and silver for our upcoming meal. The meal was prepared and presented by culinary students at the hotel. The dark things in front of the fish are snails. Pretending to myself that I didn't know what they were, I managed to eat one. It didn't taste bad (nor particularly good), but I had to chew and chew, so it didn't slip down easily and I backed out on a follow up. Looking at this in retrospect, I think this is a dessert arrangement is what's called Café Gourmand, which is an espresso with three small desserts -- a dessert sampler, so to speak. I liked that little green pudding with the red sauce -- a sweet and tart contrast. After the meal we take a walking tour of the village. There is the fountain. I haven't done a headcount of fountains in mountain top villages, but I'm perceiving a theme. The two metal bars that the water drops between are a common feature, but I haven't noticed whether the entire fountains are alike. Sounds like a research topic for the next trip to France! There will be photos. An iron sign of a rooster, with "insolite" written below . . . it means strange or unusual. As we whiz by (it's a hillside city . . . I'm huffing and puffing just trying to keep up), I don't take note of what's unusual here. Gosh, maybe this is the passageway behind the sign. A place to come back to and explore. We go into the Mougins photography museum. It contains some unusual and interesting photographs -- which we're not allowed to photograph. 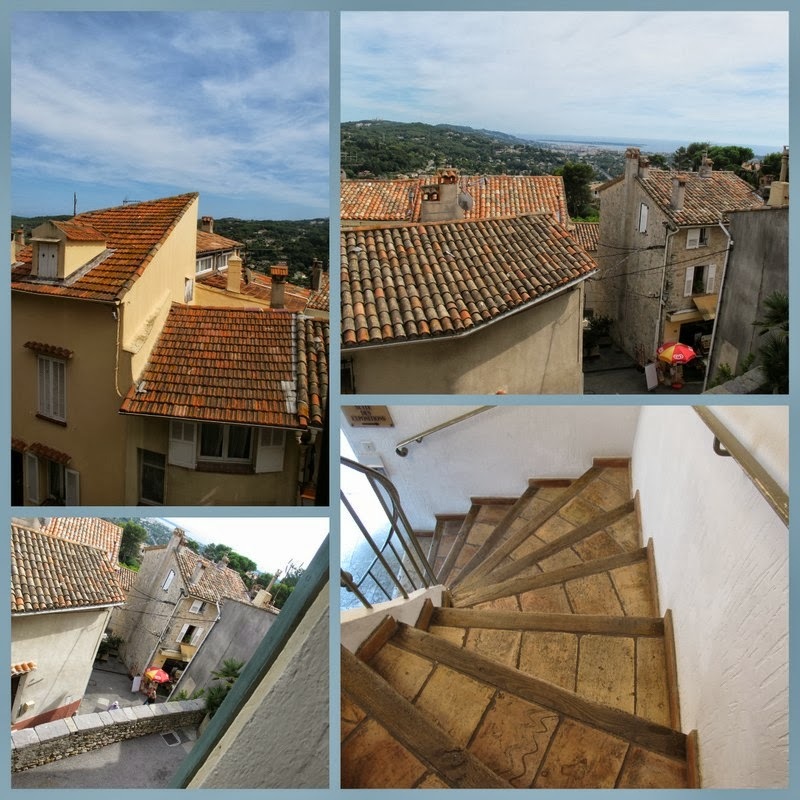 Once again, photography out the windows is permitted, and our climb up several stories gives us a view of tile rooftops, and a view going back down the spiral staircase. 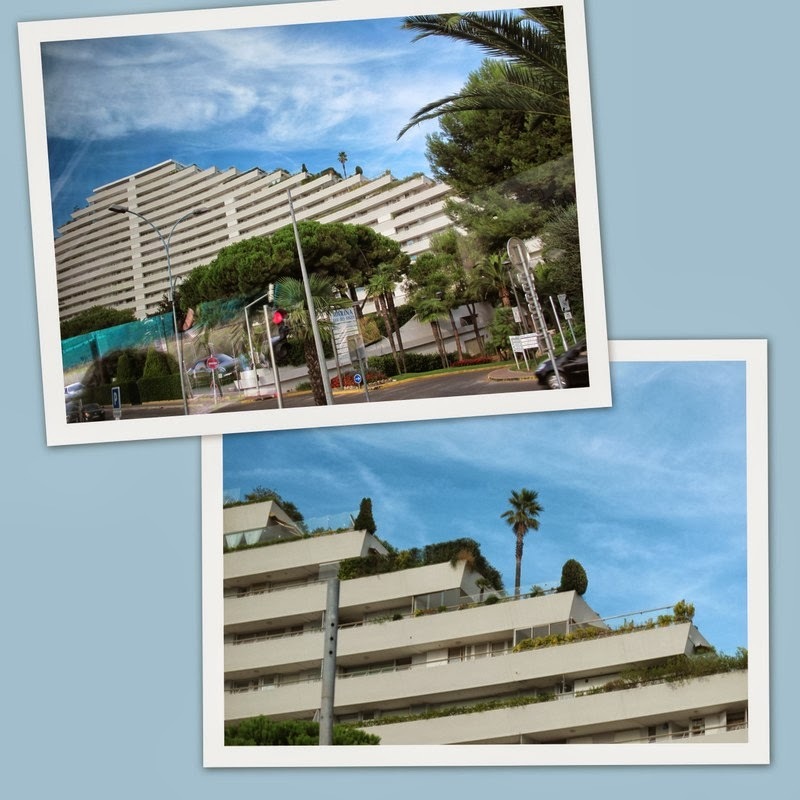 The final leg of the journey today is to go to Cannes, site of the Cannes Film Festival each May. 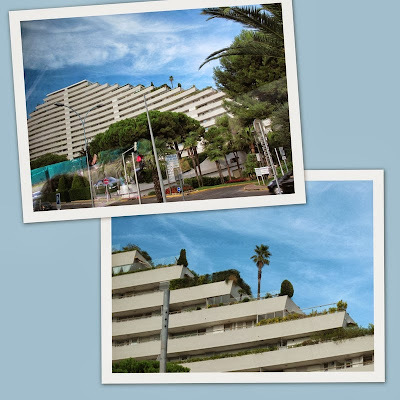 The visit is a drive-through of a long avenue of hotels and apartments. Many are in private ownership and are opened seasonally for the owner's use. There are some kinds of tax advantages to owning your own vacation place vs. trekking south to a hotel year after year. It's rush hour as we head back to Nice. Notice what looks like two grey pyramids in the center of the road straight ahead. They are a prominent feature along the bay. You see them first as your plane comes in for a landing at the Nice airport. They are curved. They are fascinating. It's hard to get a good view of the curvature from on the ground, but you can see how they "taper" up to the top. And you can see that there are even trees on it. There are residences and shops and the services of a small -- or not so small -- city. Several of us finish the day off at the Deux Palmières. Yummy lasagna and salad. I've been planning ahead on this trip to go to a restaurant in Saint Rémy to have the best ever Café Liégeois, so I'd looked at this menu a couple times and thought I'd defer my Café Liégeois for the best ever. Then it occurred to me there was no reason I couldn't have one in Nice, and it's a darned good one, too. Next, San Remo, in Italy, and the Principality of Seborga, if it doesn't run too long for one blog. What a grand day! The views, the history...the Café Liégois! Wonderful. Sounds like a very busy tiring day. I happened to be walking by that door that's painted like a half-open door, just as someone walked out. When the right side of the door is opened, the view is very much like what's painted on it--a pantry wall in a kitchen with hardwood floors! I too found myself with a mouthful of snail, but managed to (I hope discreetly) spit it out. It was that or upchuck over the balcony, and it was too pretty there to do that! So it isn't just a Friday thing . . .